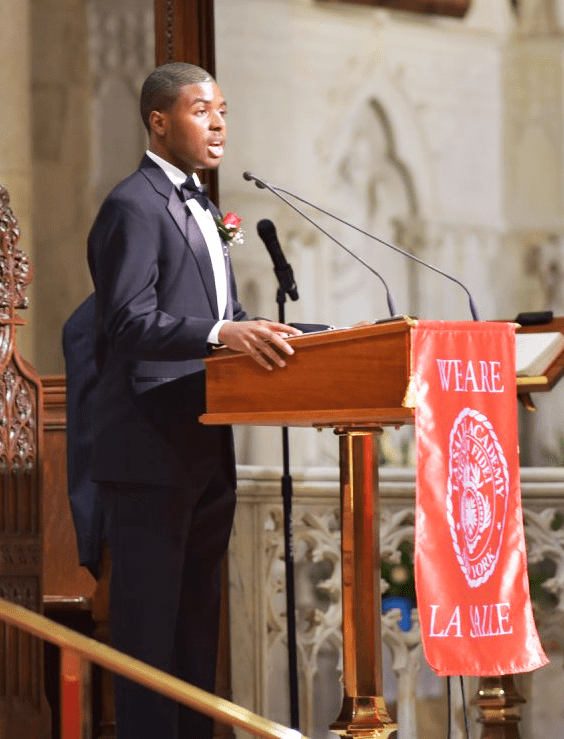 CSF Alumnus Daniel Baker recently graduated as salutatorian of La Salle Academy, and plans to enter Colgate University this fall to major in economics. Future goals: My hope for the future is that I achieve every goal I set for myself and more. One of my possible future careers is becoming a lawyer. My interest in law was strengthened after my internship at Leahey and Johnson Law Firm. What Daniel’s CSF scholarship has meant: The support from CSF has led to many great things happening for me such as acceptances to colleges, becoming salutatorian of La Salle’s graduating class of 2018, and more. My family and I are very grateful. CSF alumni perspective: My experience with CSF as an alum has been beyond exceptional. I loved meeting the Young Leaders and building relationships with them. As a student entering college, it was great to get advice from them. CSF reassured me that help is always there when you need it. His inspiration: My mother motivates me. Growing up, I have experienced struggles and hurdles that I have overcome with her help. I work harder for her. Advice to younger students: Never settle for less than you think you deserve. Personally, I have seen people who have settled in life and I believe it is the worst thing you can do. Try your best in school and never give up on your goals no matter how impossible they seem.